Soak all the ingredients for 4 to 5 hours except Beaten rice. And soak Beaten rice just before grinding. Grind all the ingredients, add soaked beaten rice and cooked rice at last. keep the batter in a warm place to get ferment for overnight. Just before preparing Dosa add maida, salt, Baking soda. Heat pan or griddle with little Butter. Spread the mix on pan in circular motion to make thin Dosa and cook both the side with 1tsp butter on each side totally 2tsp butter or more. Benne Dosa is served with Coconut chutney and potato curry. Pressure cook Potato, onion and salt. when it gets cool mash slightly and serve with Benne Dosa / Butter Dosa. Grind all chutney Ingredients with little water. Add Butter on top and serve with Benne Dosa / Butter Dosa. Soak all the ingredients for 4 to 5 hours except Beaten rice. And soak Beaten rice just before grinding. Grind all the ingredients, add soaked beaten rice at last. Prepare chutney with chutney ingredients with little water and keep it aside. Just before preparing Dosa add salt, Baking soda and also optional Ingredients. Spread the dosa batter on pan in circular motion to make thin Dosa. In a cup beat a Egg with pinch of salt. of Dosa then cook both the side. On the egg side spread red chili chutney and fold the Dosa. Cut avocados in half. Remove seed. Scoop out avacado from the spoon, put in a mixing bowl. Using a masher mash the Avocado. Add the Onion, Tomato, Garlic, Green chilies, coriander, lemon juice and salt mix well. Serve with corn chips / any whole grain chips. Guacamole has very less carb may be 5 to 6 gm and Avocado is rich in fiber. Shallow fry green chilies then mix all the ingredients and make chutney. Prepare seasoning and garnish on top of the chutney. Serve Coconut peanut chutney with Idli / Dosa. 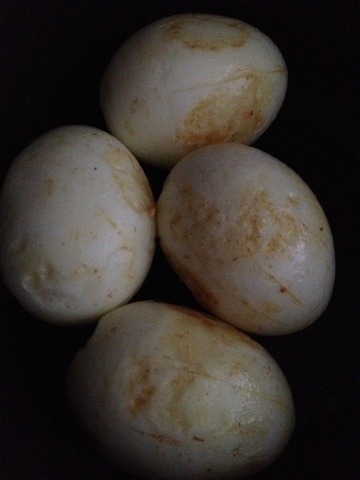 Cut Boiled egg into half. 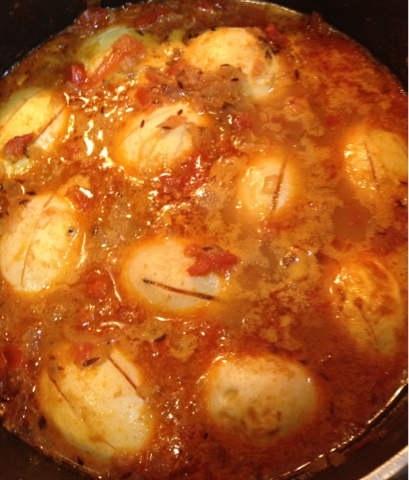 Heat a skillet Place Egg on it with little oil, sprinkle methi, pepper, daniya, jeera powder each side and salt as well. Roast it for few min on each side. Serve Egg fry as a side dish with rice. Method:Make powder with powder ingredients. and keep it aside. Prepare seasoning with mustered seeds, jeera, red chilies, curry leaves, Asifotida and add garlic then onion, when it gets soft add washed Masoor Dal fry for few min now add 1 cup water, let it cook for a while add water if required finally add Tomato and powder and cook for 2 to 3 min. Prepare seasoning in a cooking pan with oil, mustard seeds, jeera, red chilies. when mustard seeds stops sputtering add Green chilies, curry leaves, Asifotida and add onion, garlic. when Onion gets soft add Tomato and cook for 5 minute. Add seasoning to the cooked Moong Dal and mix well. Shallow fry Cashew nut, Raisin, Almond, Raisin with ghee separately and keep it aside. Fry Shavige / Semiya with little ghee for few min then add 1/2 cup water and cook for 5 to 10 min, Once Shavige / Semiya becomes soft add milk and sugar boil for few min. Garnish with nuts and saffron. Wash and soak Sabudana / Sabbakki / Sagbeyam for 4 to 5 hours. Fry Sabudana / Sabbakki / Sagbeyam with little ghee for few min then add 1/2 cup water and cook for 5 to 10 min, Once Sabudana becomes soft add milk and sugar boil for few min. Postpartum: Sabudana / Sabbakki / Sagbeyam Payasa / Kheer stimulates milk supply. Take a bowl and mix Besan, rice flour, red chilli powder, Daniya Jeera powder, ginger garlic paste, salt, soda using water into a smooth thick paste for bajji. Dip Potato / Zucchini slice in the bajji batter (it should coat the Potato / Zucchini slice fully) and drop immediately in the hot oil. Deep fry until it turns into golden brown color. Remove and keep it in the tissue paper to drain any excess oil. Gestational Diabetes: Zucchini Bajji is on of the best snack. all other ingredients has very very less carb. Cut each Egg into four pieces(length wise). Take a bowl and mix Besan, rice flour, red chilli powder, Daniya Jeera powder, ginger garlic paste, salt, soda using water into a smooth thick paste for bajji. Batter should be more think compare to other bajji batter. Dip Egg in the bajji batter (it should coat the Egg fully) and drop immediately in the hot oil. we have to be very care full as there are many chances of bursting. Powder daniya and jeera first then add remaining ingredients and make powder. make paste of garlic and salt add all other ingredients and make powder. Ridge gourd skin Powder is very tasty with Rice /Talipattu. Clean and wash the brinjals. Cut the brinjals into four in such a way that the stem is intact so that it won’t break while stuffing or frying. Take a frying pan with little oil and fry the brinjals until its soft. You can keep covered for sometime so that it gets cooked faster. Meanwhile Make powder with stuffing ingredients. Take a bowl and mix Besan, rice flour, red chilli powder, salt, soda using water into a smooth thick paste for bajji. Now stuff the half cooked brinjals with the ground powder (little is enough) so that if you press the four parts together, the powder should not squeeze out. & keep aside. Repeat the same for remaining brinjals. Dip the stuffed brinjals in the bajji batter (it should coat the brinjal fully) and drop immediately in the hot oil. Dry fry red chili for few min when it gets cool mix with garlic, jeera, salt make powder then add coconut and make powder. Serve this powder with rice / chapathi and add little ghee. 1. Take whole-wheat flour in a bowl, add Grated Cucumber(with Skin), Chopped Coriander, Sesame seed, salt, chilli powder, and water if required and knead into a dough. Cover and set aside for fifteen minutes. 2. Divide the dough into eight equal portions. Roll into balls. Roll the balls in dry flour and Roll out into medium thick paranthas. 3. Heat a tawa and place a parantha on it. Cook on medium heat for two minutes. Turn and apply ghee on the cooked side. Turn again and apply some more ghee on the other side too. Cook till both sides turn a golden brown. Soak urad dal for minimum four hours and grind it in the mixer till it becomes a paste. Let the batter ferment for overnight and in the morning Mix it with Raagi flour and add a little salt to taste. Now you are ready to make delicious and hot dosas using Ghee(for more taste!) or oil. Enjoy the dosa with Coconut Chutney. 1. Take whole-wheat flour in a bowl, add Chopped methi leaves, jeera, Besan, salt, chilli powder, and sufficient water and knead into a dough. Cover and set aside for fifteen minutes. 4. Serve hot with Ridge guard chutney. 1. Take whole-wheat flour in a bowl, add Grated Sarekai(with skin), Sesame seed, salt, chilli powder, and water if required and knead into a dough. Cover and set aside for fifteen minutes. 1. Take whole-wheat flour in a bowl, add onions, Grated carrot, Jeera, salt, chilli powder, and sufficient water and knead into a dough. Cover and set aside for fifteen minutes. 4. Serve hot with onion chutney. Chopped green coriander - 1 tbsp. Coriander seed - 1 tbsp. Shallow fry Egg with 1tsp oil and slit slightly using knife, keep it aside. Grind all masala ingredients using little water. Prepare seasoning with 2tbs oil, jeera, Bay leaves, then add chopped onion, when onion gets tender add ground masala and fry for 8 to 10 min. add egg and cook for few min. Prepare seasoning with mustered seeds, jeera, clove, cinnamon, Bay leaves, red chilies, curry leaves, Asifotida, add onion, when it gets soft add Tomato and cook it for few min. Add Egg(slit slightly with knife or fork) and fry for few min. then add salt, chili powder, Daniya jeera powder and water .when the water starts boiling add coconut milk when it starts boiling turn off the flame. Prepare seasoning with mustered seeds, jeera, red chilies, curry leaves, Asifotida add onion, when it gets soft add Tomato fry for few min. then add water, Boiled Egg(slit egg slightly with knife or fork), salt, chili powder, Daniya jeera powder and water .when the water starts boiling turn off the flame. Prepare seasoning with mustered seeds, jeera, red chilies, curry leaves, Asifotida and methi seeds, when methi seeds become light brown add onion, when it gets soft add Egg and fry for few min. then add tamarind water, salt, chili powder, Daniya jeera powder, Tomato. when the water starts boiling turn off the flame. Prepare seasoning with mustered seeds, jeera, red chilies, curry leaves, Asifotida and methi seeds, when methi seeds become light brown add onion, when it gets soft add tamarind water, salt, chili powder .when the water starts boiling turn off the flame. In a cup take half a cup water add tamarind paste, roasted chana powder, sambar powder, salt mix well. keep it aside. Prepare seasoning with mustered seeds, jeera, red chilies, curry leaves, Asifotida. Add onion when it gets soft add tamarind mix water. when the water starts boiling turn off the flame. Prepare seasoning in a pressure cooker using seasoning ingredients, then add Washed rice, Sprouted methi, daniya, jeera powder, salt, red chili powder, turmaric powder, ghee, 2 cup water now pressure cook rice. Transfer Khichdi to a serving dish and garnish with chopped coriander. Mix all the ingredients to Rice flour/ Jowar flour well to a soft dough except oil . Place it on a piece of parchment paper or a greased plastic sheet and flatten it with the palm of your hand. Using your finger tips, roll the dough out into flat circular discs the thickness of say rotis. Transfer the discs to the skillet. brush it with some oil on top. Cook till the Talipittu changes color and flip. Cook on the other side till golden brown specks appear. Mix all the ingredients to Jowar flour mix well to a soft dough except oil . Pressure cook Quinoa with 2 cup water by one whistle. let it cook for few min. Open the lid and mash quinoa using potato masher. Mix all the ingredients to mashed quinoa, mix well to a soft dough except oil . Mix all the ingredients to Sajje rava / Sadda Rava, mix well to a soft dough except oil . Wash Cracked wheat and Moong dal. In a non stick pan fry washed Cracked wheat and moong dal, Chopped ginger, green chilies for 6 to 8 min. Then pressure cook adding 4 cups of water. Prepare seasoning, add one cup milk n 1/2 cup water then add cooked cracked wheat and moong dal. boil it on low flame for 5 to 8 min. Serve hot with Onion Gojju. or coconut chutney. Roast all the ingredients for few min(lightly). Make powder. Filter the flour using flour filter for babies older than 10 months. Mix all ingredients and cook for 3 to 4 min. until it becomes thick. When it gets cool to room temperature then its ready to feed baby. For older kids ratio can be changed like adding more almonds etc. · Its a good source of Calcium. · It is a good source of Protein. · If we are adding Jagarry then it will be a good source of Iron too. · It has natural fiber. · Good source of whole grain. · It contains good fat(Almond and Ghee) which is very much needed for brain development. Last but not the least it’s a homemade cereal for our little babies. The best time to start Ragi malt is during 5th or 6th month. Mix all the ingredients to Raagi flour, mix well to a soft dough except oil . Chop tomato, onion. Add all the ingredients to Onion except oil and Chat masala , mix well. Heat oil in a Pan, and deep fry Pakoda. Sprinkle Chat Masala on top and serve hot. Cut onion into length wise. Add all the ingredients to Onion except oil, mix well. 1. Take whole-wheat flour in a bowl. Add chopped spring onions with greens, chopped green chillies, carom seeds, salt, mashed potatoes, red chilli powder, chopped coriander leaves, yogurt and sufficient water and knead into a dough. Apply oil, cover and set aside for fifteen minutes. Heat oil, add bayleaves, clove, cinnamon, Jeera chopped onion and sauté’ onion till golden brown in color. Add Ginger Paste and Garlic Paste. Cook for a minute. Add red chili powder, coriander powder, turmeric powder and cumin powder. Add Diced potato and Green peas cook for 15 minutes. Add Chopped tomato and cook for few min and garnish with chopped fresh coriander. Mash Slightly and Cook until gravy is thick. Pressure cook potatoes, peel and mash thoroughly. Soak bread in water, squeeze and add to the potatoes. Mix with finely cut onions, chillies, coriander leaves, garam masala, grated Paneer, salt, mango powder and small amount of the finely chopped palak. Deep fry in hot oil and keep aside. Chop onions and mince ginger. Wash and chop palak finely. Heat a teaspoon of oil in a pan and fry the palak with a little sugar added to it. In few minutes it becomes soft. (sugar is added, which preserves the green colour). Remove from fire, cool and grind to a smooth paste. Heat butter in a 'Kadai', fry chopped onions, add ginger then the ground palak with milk, salt, chilli powder, mango powder, turmeric and garam masala. Mix well and boil till it becomes a thick gravy. Add Koftas just before removing from fire or while serving. Mix Toor Dal and Rice and make rava in mixer. 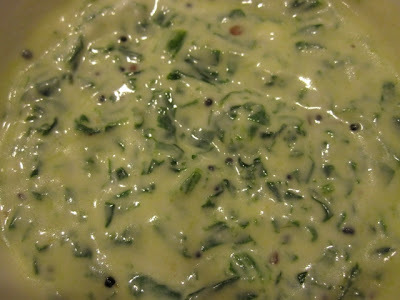 Mix all ingredient with curd and keep it aside for 5 to 10 min, add seasoning and pour dosas. In a pan heat two tablespoons of oil and fry the chopped onions. When the onions are brown add all the ingredients from the above list (i.e. list of ingredients for stuffing) except ginger and garlic. Stir on medium heat for 5 minutes. Remove from heat, add ginger and garlic and let cool. Then process the whole mixture in a blender until soft. Wash the eggplants and make two cuts through them from the bottom upward (length wise) about 2/3 the way up to the stem, so that they are each in four equal sections, held together by the uncut portion near the stem. Place the stuffing between the four sections. Next, in a wide skillet add the remaining oil and heat. Place all the stuffed eggplants next to each other and keep the heat on high. After three or four minutes turn the eggplants over. After five minutes turn them over again, lower the heat, cover the skillet and let them cook till the eggplants are thoroughly done (the skin of the eggplants should develop folds). Note: 1. If the eggplants are large, allow more time to cook. For the very large eggplants, it's better to just cut them up into pieces, mix the pieces and the stuffing, put it all in a pan and cook till done. Will taste almost like the dish made with the small sized eggplants except that it will not look like a stuffed eggplant. Also, the big ones have more water content in them, so, it might taste a bit raw and not fry as well as the smaller ones. 2. The more ripe the eggplant the less time required to cook it. Unripe eggplants will take a very long time to cook all the way through. Heat oil in a pan, add mustard seeds, cumin seeds, when they sputter, add curry leaves and onion. Stir till onion is transluscent. Add turmeric, salt, chili powder, cumin powder, coriander powder, garam masala and stir for a few seconds. Add ridge gourd and potato and stir for 2 minutes. Add a cup of water, peanut powder, jaggery, tamarind paste and let simmer on medium heat till potatoes are tender and curry is thickened. Garnish with cilantro. Serve with rotis or yogurt-rice. (beerakaaya), peeled, cut into 2 inch pieces and make a + slit on top for stuffing. Heat a tsp of oil in a frying pan and add the coriander seeds, cumin seeds, red chillis and sesame seeds and fry on medium heat till you get a nice aroma. Dont burn the spices. Just fry for 3-4 min stirring continuously. Remove and cool. Once cool, make a paste of the above spices along with ginger garlic paste, jaggery, tamarind, salt and onions. Take a tbsp of the paste and stuff each of the slit ridge gourd pieces. Heat oil in a pan and add some curry leaves and stir fry for a 3-4 seconds. Place the stuffed ridge gourds in the pan and let it cook covered on medium heat. After 4-5 mts, uncover the lid and turn the pieces so that they cook all over. Cover and cook on low heat till the ridge gourds become soft. This could take about 20 minutes. 1.Slice brinjals lengthwise and deep fry in hot oil till golden brown. Keep aside. 2.Fry sliced onions till golden brown and then grind to coarse paste. 3.Heat oil in a frying pan and fry cut onions till golden. 4.Add sliced tomatoes and fry till it becomes pulpy. 5.Mix ground paste of onion, chilli powder, ginger garlic paste and fry for few minutes. 6.Add salt, jaggery and tamarind extract. 7.cook for few minutes. Add roasted and powdered ingredients. stir for few minutes. 8.Pour 2 cups of water and when it starts boiling add fried brinjals and cook till it becomes a thick gravy. Simmer in boiling water for 3-4 minutes. Chop potatoes into medium chunks. Add curds, stir continuously, till boiling resumes. Add potatoes, cauliflower, cook till gravy thickens. When gravy is thick and oil separates, add lemon juice and it is done . Soak Black eye bean / halasandi kaalu for 2 hours. In a pan heat oil and add all seasoning ingredients, when mustered seeds stops splutter add finely chopped onion, garlic fry for few min now add Black eye bean / halasandi kaalu and fry for 3 - 4 min. Pressure cook adding 1 cup water. when it gets cool open the lid and start boiling now add coconut powder, turmeric powder, sambar powder, tamarind paste, chili powder, salt, chopped tomato and boil it for 8 - 10 min. Soak Dal Moth / Matikekalu over night. In a pan heat oil and add all seasoning ingredients, when mustered seeds stops splutter add finely chopped onion, garlic fry for few min now add Dal Moth / Matikekalu and fry for 3 - 4 min. Pressure cook adding 1 cup water. Cut onion into length wise, fry onion and red chilies using 1tsp oil. fry all ingredients separately with little oil. and once it gets cooled grind it. Dry fry all masala ingredients and make powder. Wash Cracked Wheat, Moong Dal and toor dal, Chop all vegetables(beans, carrot, potato) Pressure cook Cracked Wheat, dal, vegetables, rajma, garbanzo beans all together with 8 cups of water. for the cooked Cracked Wheat add 1 to 2 cup water and boil it. mix the masala in the tamarind water and add to the cooked Cracked Wheat, add two chopped tomato. Prepare seasoning with mustered seeds, jeera, asifotida, curry leaves, red chilis once they start splutter add one chopped onion, when onion becomes soft add seasoning to the boiling Cracked Wheat. Garnish with brown onion, chopped coriander leaves and ghee. For Gestational diabetes: If u are in USA try to buy cracked wheat from Winco foods as it has less carbs. Soak rice for half hour then pressure cook adding 2 cup water and butter. let it cool. Pressure cook Quinoa with 2.5 cup water by one whistle. let it cook for few min. Open the lid and splutter Quinoa with fork. Prepare seasoning in a pan when mustered seed stops spluttering add chopped onion and green chilies, when onion becomes soft add Green beans, carrot, peas fry it until vegetables becomes soft now add cooked quinoa and Salt, cook it on low flame for 5 to 8 min. Garnish with coriander and coconut and serve hot with Peanut chutney. Keep boiling milk in a pan until it becomes 1/4 liter, then add Badam powder and boil it for few min. add Roasted Almond flakes. Refrigerate for an hour and serve cold. Bring milk to boil in a pan. Allow to cool. Skim off all the fat from the surface. Bring milk to boil again, gradually add citric acid, stirring constantly. when milk curdles, remove pan from the heat and leave covered for 15 min. Place cloth over a bowl. Pour curdled milk into cloth and strain. try to wash paneer few times with cool water to remove the citric acid taste. Gather up above curds. Hang the cloth for 15 min. Squeeze it and place a weight of around 2kg on it for one hour. Put sugar and water into cooker. place cooker on high heat. Bring to a boil, stirring constantly till sugar is dissolved. Carefully place paneer balls one be one in syrup. Close cooker. Bring to full pressure on high heat, after one whistle switch off the heat. Allow it to cool naturally. Keep boiling milk in a pan until it becomes 1/4 liter, then add Badam powder and boil it for few min. add Roasted Almond flakes. Add slightly Squeezed Rasgulla balls to milk. Refrigerate Rasmalai for an hour and serve Rasmalai cold. Add essence and serve hot or cold.